Sad news for fans of Google's fantastic Pixel line. Google confirmed today that the Pixel and Pixel XL won't be getting any software or security updates past October 2019. What does that mean for you? Well, your Pixel might start acting a little ... weird soon. Should we run to Georgia and join the ricktatorship before that happens? Get the Pixel 2 when it's ready for launch? Or maybe ... we wait things out and grab the next Pixel after that? 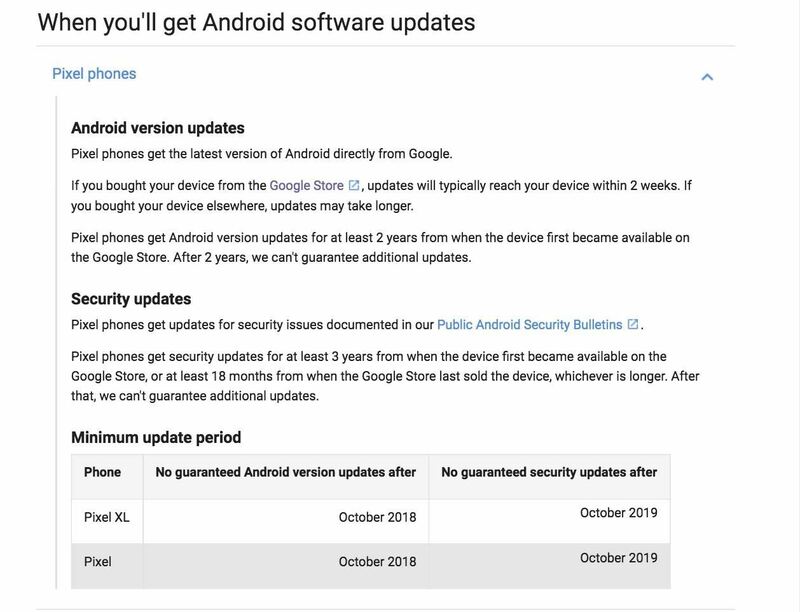 According to Google, Pixel phones continuously get security updates at least three years past the time of the phone's official release, or for a minimum of 18 months after the last Pixel is sold from the Google Store. Below is Google's minimum update period for the Pixel and Pixel XL. Don't be too sad though. Yes, by 2019 your Pixel won't be receiving any more software updates, but that's probably for the best. By that point, the original Pixel and Pixel XL will have aged. Like a lot. It will be half-dead and half-alive, only having been kept alive over its last years by a few software updates here and there — Much like that weird zombie that was stuck in a well at Hershel's farm. Past its last IV drip though, don't expect too much from your smartphone. Google will probably be spending its resources focusing on updates for its newer, living, Pixel models. Speaking of which, the Pixel 2 and XL are really something to look forward to. The phones are going to have the best mobile processor around. That's Snapdragon 835, the same system-on-chip that Samsung's Galaxy S8 and S8+ run on. The Pixel 2 variants will also be out this year, making it the perfect time to switch over before your Pixel's time is up and it tries to eat your face. Not only that, but the Pixel 2 and Pixel XL are rumored to have curved OLED screens, the same sleek look that Apple is after for its upcoming iPhone 8. So what I'm getting at here is, the Pixel 2 lineup is going to be a real competitor for the iPhone 8 and Samsung's Galaxy flagship line of phones. So, don't you worry now about the end of Google's initial Pixel, the newest models will beat out the old ones, much like how the Rick and the gang upgraded from a farm to a prison to keep the zombies at bay.